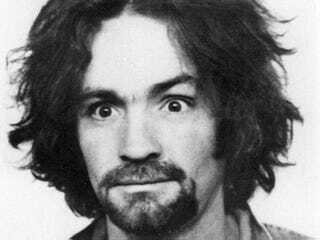 True crime fans know there's more to Charles Manson lore than true crime tale Helter Skelter. Everyone and their prison pen pal heard the recent news that 80-year-old Manson is fixin' to get hitched to his 26-year-old lady love, who answers to "Star" and believes in the old geezer's innocence. (Of course she does.) And everybody with a passing interest in Manson has read Helter Skelter, the true-crime blockbuster written by the Los Angeles DA who prosecuted the Family, Vincent Bugliosi, with co-author Curt Gentry. But there's more to Manson than Helter Skelter, and any true obsessive (you know who you are, fellow weirdo who has slooowwwwlllyy driven past what used to be 10050 Cielo Drive) probably has more than one volume of Charlie-abilia on his or her bookshelf. Here are a few of the best of the rest — please contribute your own recommendations in the comments! Released just last year, this thorough and well-researched biography takes a close look at the man behind the crossed-out forehead and incoherent Geraldo-Rivera-interview ramblings, digging deeply into his troubled early years and tracing his rise to power in the late 1960s. Probably takes the best crack to date at the essential question: how did this unremarkable-seeming man inspire others to kill? A worthy read, with bonus points for its photo section. Ever wonder what Manson's first wedding looked like? Now you know. Ok, that subtitle would be enough reason to pick up this book, which first came out in 1971, soon after Manson and his co-defendants were found guilty for the Tate-LaBianca murders. A counterculture poet and musician, Sanders focuses his book not just on Manson but the Family and its assorted hangers-on, building a colorfully-written portrait of the environment that led to the killings. (Basically, it offers the precise opposite of the uber-square POV assayed by Helter Skelter.) The Family has been updated a few times since its original publication, but try and get your hands on an older copy; chapter five, which delves into the "black-caped, black-garbed, death-worshiping Process Church of the Final Judgement," was removed from later editions after the church took Sanders' publisher to court for defamation. A big-time winner in the cover art department (Ashleigh Talbot's artwork makes Manson's famously crazy eyes even more Rasputin-like), fringe-culture expert Adam Gorightly's nearly 600-page volume also digs into the Process Church, along with other dark and titillating tentacles of Charlie's world (Anton LaVey, the White Album, LSD, COINTELPRO). Recommended not just as a Manson volume, but as a contercultural primer that contextualizes the crimes in a very specific, very freaky time and place. Is this the only Manson book that dared to publish morgue photos of Sharon Tate and the other victims? (Why yes, they really did carve "War" on Leno LaBianca stomach … shudder.) Gilmore — a sometimes actor who grew up the son of an LAPD officer — is probably best-known for Severed: The True Story of the Black Dahlia Murder, but his talent for vividly illuminating Southern California's grittier elements rings true here, too. This is another book that's gone through several editions, with added content that includes an interview with Family member, musician, Kenneth Anger muse, and incarcerated murderer Bobby Beausoleil. Yep. The "vampira who tasted the blood of her victims" (to quote the Bugliosi character in the Helter Skelter miniseries), and probably the most charismatic of the Manson Family's female members, wrote a jailhouse tome that contains her recollections of the Tate murders (possibly going a little easy on herself), but also a lot of details about life in prison and her eventual conversion to Christianity. The final photo in the book is an off-center, black-and-white snapshot of Atkins smiling, wearing a floral dress. The caption: "My smile is because of Jesus." Squint a little and she really does resemble Star, the future next Mrs. Manson. Sure, the director is famous/infamous for about a million other reasons besides being married to pregnant Sharon Tate at the time of her murder, but this 1984 autobiography is essential reading for any completist. Two memorable facts: soon before he was killed alongside Sharon, Cielo Drive houseguest and close Polanski friend Voytek Frykowski accidentally ran over Sharon's beloved dog, Dr. Saperstein (named after the Rosemary's Baby character, of course), but she died none the wiser, believing the story Polanski concocted that the terrier had run away. And even more chillingly, the last time Polanski saw his wife, he had a premonition that he'd never see her again. "If nothing had happened," he writes, "I might have no recollection of this premonition. As it is, the memory remains indelible."